Scottish Rugby said it extended the contract of chief executive Mark Dodson beyond the Rugby World Cup 2023 in France. Scottish Rugby said its turnover is at the record level of £51.4 million and debt is “at an historic low in the professional era” at an average level of £5.2 million in 2016-17. 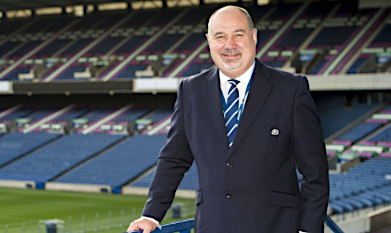 “The board are determined to build on the momentum created since his arrival in 2011 and are delighted to have concluded an agreement that keeps Dodson at the helm of Scottish Rugby beyond Rugby World Cup 2023 in France,” said Scottish Rugby. “The game in Scotland has seen a resurgence in recent years at international and professional level. “The national team, age grades, sevens and women’s teams have all experienced a sharp upturn in success and competitiveness. “The Scotland team remains fifth in the world rankings, the U20’s cohort have competed strongly at the World Rugby U20 Championship and recorded a victory over their English counterparts in the recent Six Nations tournament. “The BT Sport Scottish Rugby Academy, established four years ago, is now developing a conveyor belt of talent. Scottish Rugby said financial support to Scotland’s grassroots clubs has increased by more than 40% since 2011, with increased direct funding support and the introduction of the Club Sustainability Fund where £1.6 million is being made available over four years for club sustainability and capital projects. Scottish Rugby Chairman Colin Grassie said: “It was important we continue the excellent momentum Scottish Rugby is generating at this time and as a board we felt it was right for Mark to see through the exciting projects we are developing and provide valuable continuity. “As the scale of the business grows it is vital there is strong, proactive leadership to ensure all the respective departments and teams are functioning to their maximum and we progress at all levels of the game. “I’d like to acknowledge the role of my predecessor Sir Moir Lockhead who recruited him and thank Mark for the excellent work he has undertaken so far. Dodson said: “I was delighted to accept the board’s offer to lead Scottish Rugby through to the 2023 Rugby World Cup. “I think we have made good progress in recent years and I am excited by the challenges that remain ahead. “It was, for me, the right decision to stay on and continue to develop this outstanding organisation. “I am fortunate to lead an incredibly talented workforce who are hugely committed to developing rugby at all levels of the game. “We have put ourselves in a very strong position to develop the game in Scotland. Scottish Rugby President Rob Flockhart said: “I have worked with Mark closely over the past two years. I am delighted he has agreed to continue in his role through to 2023. “I know how passionate he is for rugby in Scotland to be a success, at all levels of the game. “I think it is important there will be clear continuity in the coming years at chief executive level. “There are ambitious plans in place to develop the infrastructure of the club game.